To help alleviate traffic backups that tend to occur during peak arrival and departure times, alterations will be made to the traffic pattern and parking designations on the first level of East Deck 1. The work will cause several traffic pattern and direction changes as it progresses. Please pay close attention to signage and lane markers to ensure safe movement. East 1 was not originally designed for automated visitor pay systems; the retrofit works well most of the time but, explains Keith Wassum, Associate Vice Chancellor for Business Services, "Backups occasionally happen. We're making adjustments to alleviate that." Add a Faculty/Staff Only exit at the rear of Level 1 for direct access to the East Deck 2 exit. This exit will be installed later in the summer. For those who park on the lower level of East Deck 1, egress will take an odd path for the next few weeks. Until the new exit is installed from Level 1, all vehicles parking in this area will be required to go up the ramp from Level 1 to Level 2, circle around, and then exit. "It's going to be awkward for a few weeks," says Wassum, "but now is best time to make these tweaks." Faculty/Staff and Visitors who park on the second through fourth levels will exit as normal. For questions, please call the PaTS Call Center, 704-687-0161 (open from 5:00 AM Monday, continuously through 10:00 PM Friday) or write pats@uncc.edu. Do you have the latest Everything About Parking and Transportation Services guide? Pick one up at the PaTS office or Auxiliary Services office, or download the printer-friendly pdf. Start your day feeling Feisty! Feisty's in Prospector building is open for breakfast this summer and it’s being made VERY NICELY! 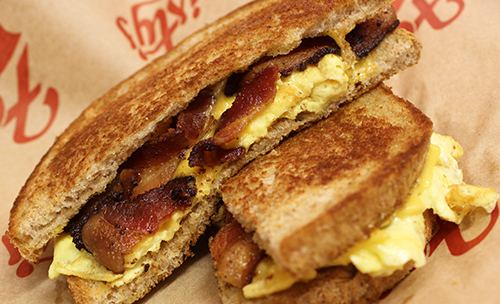 And how about this bacon and egg grilled sandwich? It's a real eye-opener because the bacon is jalapeño infused. 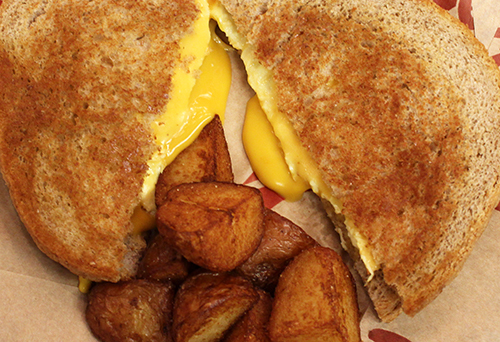 That crispy zip pairs just right with the creaminess of scrambled eggs and cheese. Even the bread is special. It's artisanal "can bread" (baked in a #10 tin can) from Masada Bakery, respected crafter of Old World breads. 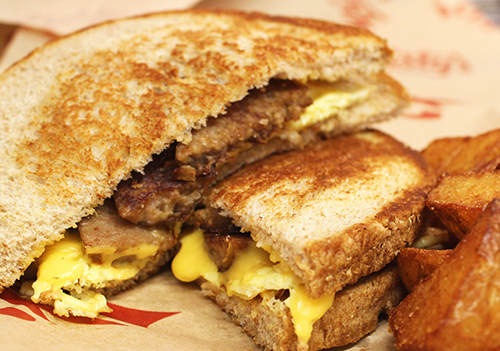 There are three breads from which to choose for your Feisty's breakfast sandwich: white, wheat and marble rye, and all are certified organic with no trans fats. So check out the new breakfast menu at Feisty's in Prospector. Breakfast is served from 7:30 – 10:30 AM, Monday through Friday. 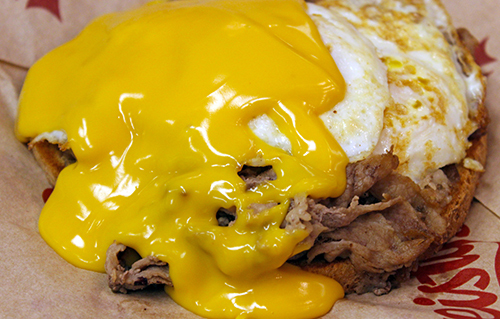 Tell Corey how you prefer your eggs and he'll cook them just the way you like for your sandwich. Textbook buy-back begins at Barnes & Noble at UNC Charlotte in the Student Union. Last day to return rented textbooks. Last day of regular spring dining hours. Exam week hours begin. Last chance to use meal swipes. Dining Halls close and meal swipes expire after the dinner hours. Declining Balance [DB] funds attached the following meal plans EXPIRE. Unused funds are forfeited, so. please, use them up! Funds remaining from the Straight DB ($845) plan remain available through the summer sessions, expiring August 5. Remember, you can use DB at the campus convenience stores (Outtakes in the Student Union and SoVi Market + Bakery in South Village Crossing). Money deposited to 49er Account and Optional Dining Account (ODA) does not expire and rolls over semester to semester, year to year, as long as you're enrolled. It does not mean that those without permits may park on campus. Permits are required and meters and Visitor decks and lots require payment of fees. More information. Campus shuttle service remains on regular service schedule until ending at 6:00 PM. There is no shuttle service over summer. Service to resume the first day of classes, August 24. Resident students, please remember to EMPTY your mailbox and complete a change of address form if you want your mail forwarded over the summer or permanently. If you recall a time when permits were not enforced during exam weeks and breaks between class sessions, or if you have a move-out brochure or notice that claims a period of no enforcement, that is out-of-date information. "Relaxed enforcement" is no longer as relaxed as it used to be. Permits are required whenever the University is open. That means even during exams and when classes are not in session. Those without permits are required to park in Visitor parking or at meters and pay the standard hourly fee or buy a temporary permit. Temporary permits are available at the PaTS Office for $6 per day. Why did the policy change last year? Lots 4 and 30 (and for disability parking, Lot 28). As Visitor parking options increased, so did the number of complaints during exam weeks from permit-holding students and staff. To them, relaxed parking periods meant unfair disruption and space competition with those who had never bought a permit. The time had come for an unfluctuating enforcement policy. Establishing an enforcement policy that's consistent throughout the year is not a move designed to write more citations and collect more fines. In fact, PaTS and the University do not financially benefit from citation fines. State statutes govern our parking fines (GS 115C-457.1-3, page 305) and the law requires that, minus the cost of collection, fines be remitted to the State. The cost of collection is capped at 20% and costs University more than the amount we’re permitted to keep. For short term parking by a building to carry something in or out, call the PaTS Call Center at 704-687-0161. Give your vehicle information and location. You'll be given some direction and 15 minutes to park. PaTS' Call Center line has someone available to help you 24/5 (weekdays from 5:00 AM continuously through 10:00 PM Friday). When in doubt, ASK, please! Summer parking permits will be available for online purchase May 1 and may be picked-up from the PaTS Office May 11. If you bought a full-time permit in the fall or spring (Commuter, Resident, Greek Village, Faculty/Staff) your permit is good throughout summer (expiration is August 14). Summer permits cost $110 per session (Summer 1 or 2) or $185 for both sessions. This time of year offers pop up on Twitter and Craigslist that seek to sell unexpired full-time permits to summer students. Please, don't fall for that! Permits are registered to a specific person and vehicle. Buying and then using a permit registered to someone else may subject you to fines and other penalties. UNC Charlotte parking permits may only be bought through PaTS. We're also on Twitter, @unccparking. That's right, 0% increase! Which is especially good news considering that prior to 2014-15, the price was rising five to eight percent every year. Permit prices are determined by how much will be needed to support a ten-year financial plan that will pay for parking that accommodates enrollment. Although enrollment increased this year (and is expected to do so again next year) the demand for parking has leveled off. More students are electing not to bring a car on to campus, choosing remote parking options, taking campus- or apartment complex-provided shuttles, walking, and biking. No increase in demand means no need to plan, build and pay for additional parking facilities at this time. Want to know more about how permit price is determined and where the money goes? Read The Truth About UNC Charlotte Parking. Another thing Parking and Transportation Services releases this time of year the semester's parking space inventory. Spaces may be few in areas closest to the center of campus at the most densely scheduled class times, but there's plenty of parking available elsewhere. Space counts, which are taken regularly, prove that UNC Charlotte has sufficient parking for visitors, faculty, staff, and students. Students are the population who most heavily use parking and for whom most of the parking is designated. As you can see, even at peak scheduled class time, thousands of available parking spaces are empty. Here are the numbers for Spring 2015, Monday - Thursday. * Italicized rows are areas that tend to fill at peak class times. Bold entries have the most parking to spare. Everyone wants to park as close as they can to their class and most classes are scheduled from about 9:00 AM to 2:00 PM. Therefore, more students are trying to park in the same places at the same time. Your competition is stiff. Take a look at the Commuter parking areas in bold. Did you know that every one of them has a shuttle stop? For just one day, try parking in Lot 6, North Deck or South Village Deck. The Red Line runs three buses from Lot 6 through the center of campus via the Student Union and out to the CRI campus (Mon-Thu; two buses Fri). You can catch the Green Line from North Deck and both the Yellow and Green Lines from South Village Deck. Download the UNCCNextRide app or view the mobile web site to see where the shuttle is and when it will get to your stop. It may seem odd to park so far away from your familiar, preferred spots, but just do it ONCE. After you see how easy it is to get from where you've parked to where you're going, it won't be nearly as annoying to park there are days when your favorite parking area is full. There's NO REASON to park illegally in a full lot or deck and risk getting a citation and there's NO REASON to circle a deck until you miss class. There are still no plans to take down the Belk Tower to put up a 20-story parking deck. Future parking facilities will continue to follow the campus master plan and be placed toward the margins of campus. *Counts taken over a two week period of normal class schedule (no holiday/break). Lot CRI 2 will be closed Friday, April 10 as mobile units for the National Health and Nutrition Examination Survey (NHANES) are positioned. On Monday, April 13, the lot will reopen although 1/3 of the parking spaces will be occupied by NHANES survey trailers which will remain for about seven weeks. Alternative parking is in CRI Deck 1. Permits that allow parking in Lot CRI 2 (Commuter and Faculty/Staff) automatically raise gates and allow parking in the adjoining deck. The date and menu are now set for the spring Homegrown Dinner at Bistro 49. Make plans now to enjoy the most vibrant tastes of the season. Campus chefs are planning a luscious, five-course meal using fresh local meats, cheeses and produce. Price per person is $25. The timing of the Homegrown Dinner coincides with both Adminstrative Professionals Day and Earth Day, which makes perfect sense: supporting environmental protection and honoring those who keep our department's world turning should be celebrated together! This is also a date-worthy event. So, pick your reason to celebrate and reserve a table soon. This event is BYOW [wine] for those 21+ with proof of age. For students with meal plans, price is 1 meal swipe + $15 DB or ODA. Seating is limited. Please stop by Bistro 49 (second level, Student Union) or call 704-687-7056 to make your reservation; $5 reservation hold required. Raleigh, N.C.: Jennifer Leamons, Executive Catering Chef for UNC Charlotte, earned a Silver Medal in a culinary challenge held March 13, 2015 at the Southern Regional Conference of the National Association of College and University Food Services (NACUFS). She was selected to compete based upon an original recipe submission featuring a main protein selected by NACUFS executive leadership, which this year, was buffalo flank steak. Thirteen chefs presented recipes from the Southern region and among those, six were chosen; Leamons was the only representative from the UNC System and the only woman. Challenge participants worked under the pressure of a time limit to display their best culinary techniques as they prepared qualifying recipes in front of three American Culinary Federation approved judges, two of which are Master Chef Certified. The competitors had 60 minutes to prepare two classical cuts of the meat, along with sides and sauces to create a balanced plate. For the ‘Future’ portion of her dish, Leamons honored a dietary trend that she believes will the norm in the future: animal protein served in quantities proportionately smaller to vegetables. “It was a salad of local micro greens, pea shoots, popcorn shoots and arugula, topped with a small portion of grilled flank steak and a tarragon white balsamic vinaigrette. Want to know more about the NACUFS Culinary Challenge? Here are the rules under which Chef Jennifer competed and will be used in the national competition later this summer. Jennifer Leamons grew up in a small town in Maine. At the age of 12 she knew she wanted to be a chef and enjoyed cooking with her grandmother, who could somehow find a way to put carrots in everything she made. She received a B.S. degree in Culinary Arts from Johnson & Wales University in Providence, R.I. Her career has included work as chef for a sailing adventure company, catering chef for movies and concerts, chef manager, hospital chef, and chef instructor. 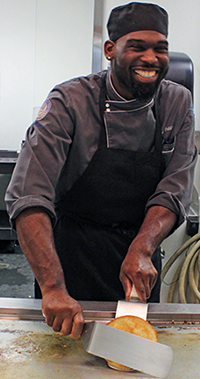 In September, 2014, Leamons was recruited by Chartwells to join the team in Charlotte as the Executive Catering Chef for UNC Charlotte. Royalties have increased year-over-year in five of the last six years. CLC’s representation of UNC Charlotte’s licensing program will continue to focus on the management of best-in-class licensees to build the University’s brand while increasing diversity and sales of the highest-quality officially licensed products. “The University has experienced tremendous growth as an institution and athletic programs have likewise expanded,” said Keith Wassum, Associate Vice Chancellor for Business Services. “Our very positive relationship with CLC that’s spanned more than 25 years affirms the reasons why CLC was initially chosen. The decision to continue our association is a confident reaffirmation that CLC is the right partner to maintain the integrity of the University and Charlotte 49ers brands and to help us elevate our presence in the marketplace in the future." CLC, the leading collegiate licensing agency in the U.S., currently represents nearly 200 collegiate properties, including 25 bowl games and the College Football Playoff, in the $4.6 billion retail market for collegiate products. About the Collegiate Licensing Company CLC is a division of global sports and entertainment company IMG. Founded in 1981, CLC is the leading collegiate trademark licensing agency in the U.S. and currently represents nearly 200 colleges, universities, bowl games, athletic conferences, The Heisman Trophy and the NCAA. The mission of CLC is to be the guiding force in collegiate trademark licensing and one of the top sports licensing firms in the country. CLC is dedicated to being a center of excellence in providing licensing services of the highest quality to its member institutions, licensees, retailers and consumers. Headquartered in Atlanta, CLC is a full-service licensing representative, which employs a staff of more than 90 licensing professionals who provide full-service capabilities in brand protection, brand management, and brand development. For more information on CLC, visit: CLC.com or IMGCollege.com. May graduates, it's time for your Commencement Fair! Gold medal-winning Olympian Shawn Johnson will share her experiences and discuss her book Winning Balance on March 19 at 7:00 PM in Cone Univeristy Center's McKnight Hall. A reception and book signing will follow in After Hours. The event, sponsored by the Center for Leadership Development’s Forty-Niner Forum, is free for UNC Charlotte Students with I.D. and $5 for Faculty, staff and community. Shawn Johnson earned an individual gold medal in the balance beam and three silver medals in the individual all-around, floor exercise and team categories at the 2008 Olympic Games in Beijing, China. In 2009, Johnson became the youngest contestant to ever compete on ABC’s Dancing with the Stars, becoming the champion of season eight. In 2012, Johnson published her book, Winning Balance and announced her retirement from competitive gymnastics following a knee injury. Johnson is involved in a number of philanthropic activities with animal and children’s charities, as well as working with cancer charities, particularly those that affect women and children. She's also involved in programs that help build good character amongst youth across the country. Winning Balance can be purchased at Barnes & Noble at UNC Charlotte or in Cone Center's After Hours on the night of the event.